Wailea's Ekahi Village is Paradise. Remodeled in a 'Tommy Bahama' style and getting rave reviews, Condo #39B feels like Paradise. Enjoy ocean views and sunsets from our large lanai, 1st floor location, which opens onto the main greenbelt in this ocean-front complex. We have a king bed in the bedroom (plus bath) and a queen Murphy bed in the living room (with a 2nd bath/closet area). Equipped with flat-screen TVs, i Pod docking station, a gourmet kitchen, stone floors throughout the condo and lanai, and tropical furnishings. We eat most of our meals on our lanai, where we have a Weber BBQ, two chaise lounges, four dining chairs and a round dining table. There is a light for the BBQ and an overhead fan above the table for those warm Maui nights. Sometimes we take our chairs out to the greenbelt and with pupus (appetizers) and wine or Mai Tai's we watch the beautiful sunset. This is truly one of the quietest locations in Ekahi Village, yet a short walk to one of Ekahi's three smaller pools and 4 minutes down the greenbelt to 'toes in the sand', our main pool, and the open-air pavilion/barbecue area. Enjoy one of Maui's premier beaches, a 3 mile walking/running path along the ocean, world class dining in nearby luxury hotels, luaus and other Hawaiian entertainment, shopping, golf, tennis, and watersports activities. Children and adults can enjoy the tide-pooling on the beach, snorkeling at any number of wonderful spots, sitting in a beach chair and reading, paddle boarding, digging holes and making sand castles. You can walk either direction on our beach to find coffee, breakfast, lunch or dinner, paddle board rentals, yoga etc. You may even spot turtles or rays in the water off the shore and in the winter whale spouting is almost guaranteed! We have traveled to Ekahi Village for over 30 years as our two families raised our children and enjoyed many wonderful vacations and special times in condos here. We finally bought two condos so we could be there together and hopefully spend some longer vacations as free time allows. The tranquility of Ekahi Village and the birds chirping in the morning make relaxing immediate after arriving. Sitting on the lanai for most meals and watching spectacular sunsets cannot be beat. We look down a beautiful greenbelt and think we have found paradise. Keawakapu Beach starts at our Village and goes a half mile one direction to one of Maui's best restaurants. The beach goes 2 miles the other direction passing the luxury hotels on the 'beach walk'. Ekahi Village is a condominium complex with a large pool at ocean's front, pavilion, showers, kitchen. There are 3 'quiet pools' in the Village. Close to some luxury hotels with great restaurants. 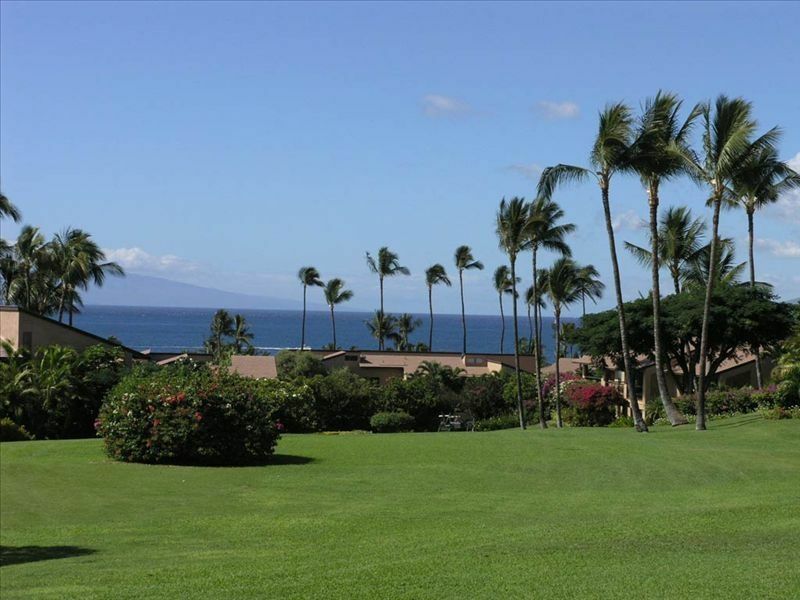 Ekahi Village is an oceanfront complex with one of Maui's most beautiful beaches right in front. People gather nightly on the beach or at our 'big' pool for our beautiful Maui sunsets. We have a lovely ocean view down the main greenbelt in Ekahi Village. We look at the Island of Lanai. There is amazing and award winning foliage all along the greenbelt. Entire complex is on the water. All buildings have a lovely walk to the main pool, pavilion and beach. Many condos have a view of the ocean. Our condo has a lovely ocean view down the main greenbelt. Ekahi is a waterfront complex, with a lovely, long beach (with great snorkeling) in front of our pavilion. We have a land-line, almost all guests have cell phones. Remote-controlled units in bedroom and living room. They cool the condo extremely well and quickly. We ask that AC is turned off when condo is empty. Must not use the fans and AC at the same time. Linens are provided for both the master bedroom king bed and the queen-sized Murphy bed in the living room area. There is a stack washer/dryer in the unit. Free parking in the area just outside of our building. Towels are provided for both bathrooms and beach towels are provided as well. Yes, instructions are in the binder on the kitchen counter. Living room has sliding glass doors that lead to the front lanai. The view is down the main greenbelt to the ocean. There is a sofa, chair and ottoman, Murphy bed, book shelves and flat-screen TV. There is a stainless steel dishwasher next to the sink. We have a stainless steel refrigerator with ice-machine in the freezer area. The stove is stainless steel and has a flat electric cook top. The oven is part of the stove. There is a new microwave above the stove. Yes, there is a toaster in the kitchen. Some spices may be available. They vary depending on time of year. We always suggest our guests go to the condo before they visit the grocery store. Many of our guests leave items for other to use. We pride ourselves in keeping the kitchen well-stocked for our guests and for ourselves. There are ample dishes and glassware, as well as cutlery, and cooking utensils, salad spinner, etc. The window looks to the ocean and out onto the large greenbelt at Ekahi Village's lush garden. A door leads to the lanai and outdoor dining area (with Weber BBQ). We have most of our meals there. We have two dining areas. One is inside by the kitchen and one is outside on the lanai that looks down the greenbelt. We eat almost all of our meals outside. There is an overhead fan for comfort. Two flat-screened TV's. One in living room and one in bedroom. We have a sound system. Some CD's may be found on the living room shelves. Guests often leave music there and we have some of our own favorites, too. Take your own to be sure you have what you like. There are many books in our book shelves and more in the book shelves down at the pavilion where the big pool is located. Again, take your favorite and today it may be on your Kindle or iPad. We have 5 grandchildren so we have put some games in the condo. However, because we don't live there we never are sure what remains in good condition. We suggest you take favorites with you from home. We do have CD's but again, we suggest you take your favorites. We do usually have sand toys on the lanai. Guests often buy, use and leave an assortment of beach "things" with us. Again, look before you go to the store to buy. Many choices on where to go to rent kayaks and/or canoes. The hotels all have them, but so do the dive shops. Google it. There is a lanai in the back and front of our condo. Table and chairs and view down the greenbelt and great dining is on front lanai. You can rent kayaks, paddle boards, boats for snorkeling, diving or sunset cruises, sailing, or whale watching. Google for info. There is a LOT to do. There are tennis courts within driving distance and they are part of the Wailea area. Phone # for information is in our binder on the kitchen counter. Wailea has 3 GREAT golf courses. Our favorite is the Emerald, with an ocean view on every hole. They give a bit of a discount for people staying at Ekahi, so inquire about it. Phone # in our binder. One "big" pool located beachside, with a pavilion, kitchen, BBQ and shaded area, as well as bathrooms/showers. There are 3 smaller "quiet" pools in various areas of Ekahi, steps from our condos. We enjoyed our stay at this conveniently located condo. Murphy bed set up was great for our teenage son. Condo is well stocked and very clean. Convenient to everything in Wailea and a good jumping off spot for exploring the island. Owners take good care of the unit and it shows. This condo is a great place to stay in Maui. I stayed with my two kids, and it was a perfect place from which to explore the island. We loved that you could be on the beach with a 5 minute walk and see whales. The main pool is warm and has a great view of the water. There is snorkeling right in front of the condo complex. The beach path is also great for walking and checking out Wailea. I really appreciated the kitchen. It is stocked with everything you need to cook meals. The murphy bed was comfortable as was the king bed. The condo comes with beach chairs, snorkeling gear, etc. There is good food within walking distance or with a short drive. I'm so happy I rented this condo. Thank you for your great review! We are so glad you brought your two children and it sounds as if you really discovered most of the great reasons we love Ekahi Village! zoe's home in wailea could possibly be the very best home we have ever stayed in! it is sparkling clean, very comfortable, very well stocked, and feels like home upon arrival! it does not get better! you walk out the door to the stunning view and lovely grassy pitch. the walk to the beach is so enjoyable, and good for you:) thank you so much zoe! we love your wailea home, and we really can't wait to return for our third time, soon! We hope you DO return and we are so happy you enjoyed your stay in our Maui condo. It is so rewarding to hear how much our guests appreciate the location, our condo and how wonderful it is to stay in Ekahi Village. Mahalo for your review. I go to the same condo over and over again. It is well-cared for and perfect. Very nice condo with beautiful ocean view! We have stayed at many locations on the island and this is by far our favorite. The condo is beautifully updated and the owners have thought of everything . We love all the green space and nice quiet location. There are two quiet pools for reading and adult time. We will definitely stay here again. This is such a lovely time of year to be in Maui. It is wonderful that these guests appreciate the location of our condo #39B within the Ekahi Village. There is sunset viewing from the lanai and whales spouting in the ocean when enjoying sunset at the main pool and pavilion. Mahalo for the great review. We absolutely enjoyed our week at this cozy condo. We found everything we needed, including a local guidebook and Fish book, supplies, and appliances, plenty of dishes/silverware, etc. We had every meal on the lanai, which looks out over the spacious lawn and ocean. The pool right down by the beach is heated and lovely - great for kids. The beach is also great - just right for walking, swimming, lounging, taking pictures. We saw some snorkelers, but did not snorkel the beach ourselves. We were not sure what to expect from a Murphy bed, which our children (12 and 17) used, but it was very comfortable, practical, and easy to use. Although we went during the busy holiday season, we found the condo and surrounding area to be calm, relaxing, peaceful, and cozy. We have stayed in quite a few VRBO properties, and I can honestly say this was our very favorite one! It is so wonderful to read a great review from our guests, whom we have never met, but who take the time to let us know how much they enjoy our Maui home. It means a lot to us and I am sure it helps future guests feel secure about coming to stay in (and thoroughly enjoy) one of our Maui Ekahi condos. Mahalo! Paddleboarding is the rage. Boards can be rented in many locations. Our kids have rented paddle boards at the end of our beach near the Mana Kai OR they are available at the Andaz Hotel (on the beach/boardwalk. Snorkel trips to Molokini Crater and Turtle Town is a must. Sunrise on Haleakala Volcano is for early risers with warm clothing. You can bike down if it is 'your thing'. Great golf courses at Wailea. Beautiful with ocean views on most holes. Too many great restaurants to mention. We have a copy of Maui Revealed (book) in our condos. It has everything you could possibly want to know. Walks on the beach or gazing at the ocean from our beach or pavilion at sunset is something to plan on most nights. We sit outside our condo on the greenbelt with cocktails and 'Pupus' . Late check out: 1/2 nightly rate, if available. 10% discount for rentals 30 days or more, plus a mid-stay clean 15% disc. for "last-minute" bookings Low Season Apr 15-Dec 14 (5 night min.) $310/nt (except summer special) High Season, Dec 15-Apr 14, 2019 $380/nt Holiday Dec - Jan (10 day min) $380/night Summer special: July 1 - Sept. 30 $285/night CANCELLATION POLICY: 60+ days*: 1 night forfeited Within 60 days: full deposit forfeited, balance forfeited unless unit is re-rented NON SMOKING UNIT $125 cleaning fee $300 refundable sec. deposit required 5 night min. on all rentals, 10 days for Dec. holiday 10% disc. for 30 nt stay, plus a mid-stay clean Late check out: 1/2 day rate, if available Empty the garbage often and keep the condo clean. Air conditioning information: We have "stop switches" put on the living room sliding glass doors. Please see the AC information sheet that is with the "Directions from the Airport, Entry & Condo Information" so that you will understand how this works. This information is also in the binder on the kitchen counter in the condo. Please leave our Maui home just as you found it upon arrival, and treat it with respect. Service Charge: *$50 service charge for lost keys, lost beach towel(s), long distance calls, locking yourself out of the condo or safe. *Extra Cleaning Charges occur when a guest leaves a large amount of laundry, sand or litter in the condo, any garbage or a messy kitchen, flushing anything besides toilet paper, or putting pineapple, potatoes, carrots, any coarse items down the garbage disposal. *When not in the unit and when departing please turn off lights, a/c, fans and lock all doors and windows. Upon departure empty wall safe and leave safe door open, leave keys on the counter, and start a REASONABLE-sized load of towels in the wash. Upon departure empty garbage, empty YOUR food from the refrigerator.